This is quite possibly the most beautiful diary we’ve ever seen. The Mother Book by Dentsu Japan was originally created in 2014 by Dentsu – a Japanese PR and advertising company – for Kishokai Medical Bell-Net Obstetrics. The diary was given to new mothers attending the clinics as a gift of thanks. 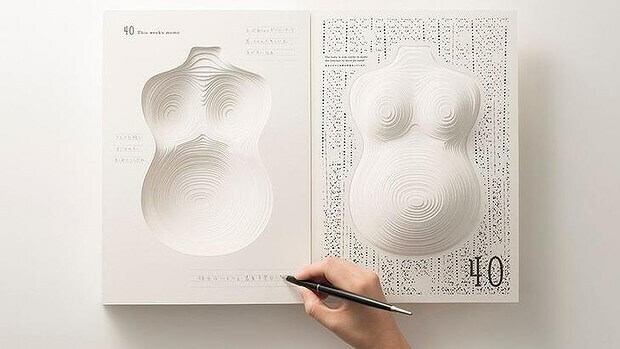 Mirroring the 40 weeks that a mother typically spends nurturing their babies inside their womb, the “Mother Book” comes with 40 pages that are each embossed to create topographical renderings of the mother’s belly and breasts. As you flip the pages and progress through the 40 weeks the book also reveals the changing shape of a woman’s body. There is lots of space for notes and memories. The book is available to order from Dr Label for £25 plus shipping (there’s also a special edition in a wooden box). Have a look at the video below to see the book in more detail.